I posted earlier in the month about using seasonal produce when it is plentiful and at its tastiest. Following on from my Rhubarb Tarte Tatin recipe, this simple cheesecake recipe takes about 20 minutes to prepare and is a guaranteed winner every time. Crush the biscuit to a fine crumb mix in the melted butter. Split the base mixture between two metal cooks rings. Place in the fridge to set. Cut the rhubarb into inch size chunks, put in a hot saucepan with the sugar, the grated ginger and a little splash of water. The rhubarb will only take a few minutes to cook through. Remove two of the chunks plus a little of the syrup and set aside, this will be used for decoration when serving. Cook the remaining rhubarb for a few more minutes, taking care not to burn the mixture. Once the rhubarb is soft remove the pan from the heat. One the rhubarb mixture has cooled a little, beat together with the soft cheese before generously spooning over the biscuit base then put back in the fridge to set. 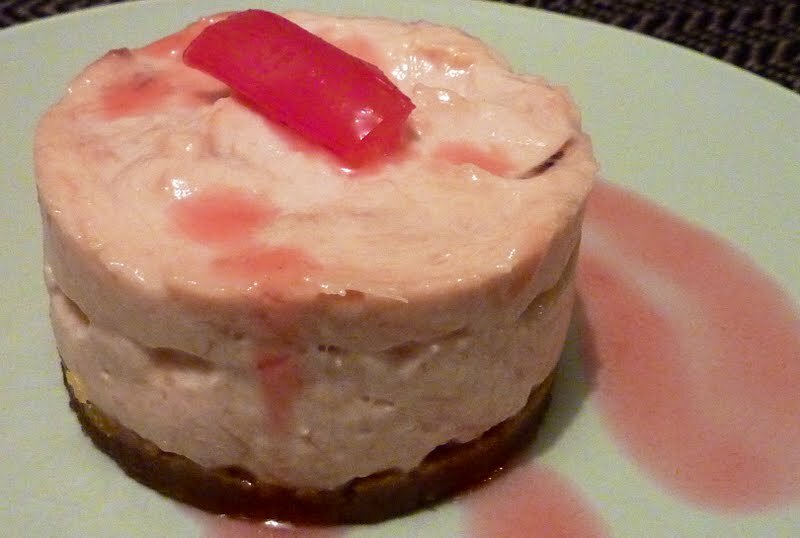 The cheesecakes should set in the fridge for at least one hour but remove from the chill about five minutes before serving. To serve, place one of the rhubarb pieces, from earlier, on top then drizzle with a little of the syrup. Rhubarb is at its best for about another three weeks, try this cheesecake recipe now and you'll be counting the weeks until next February.